Today we are introducing Shannon and Jeremy! Their wedding is coming up May 13th and we are so excited to be apart of their big day! 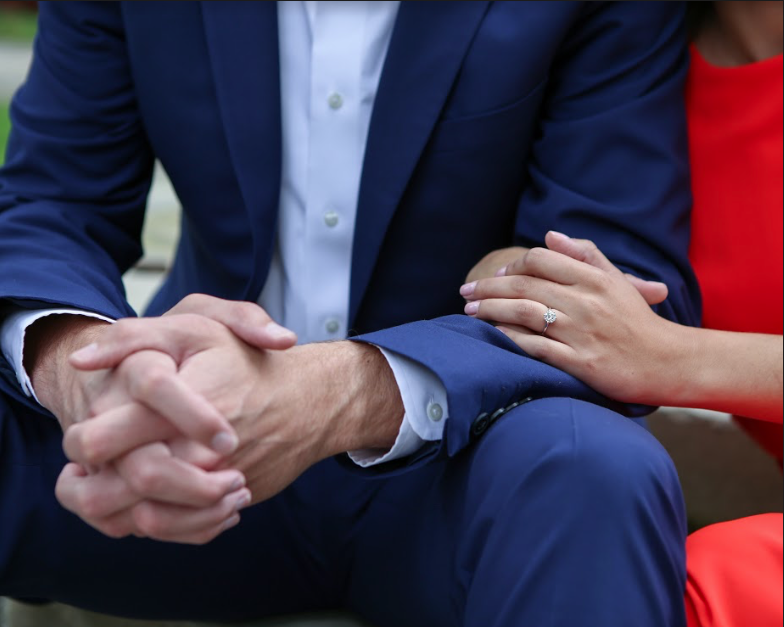 Interview questions answered by Shannon and Engagement Photos by Courtney Learn Photo! Where did you two lovebirds meet? Our paths first crossed in the fall of 2008 at the University of Pittsburgh. Jeremy was a teaching assistant trying to make a buck and I was an honors student trying to get an A+. Jeremy asked his then roommate, if he should ask me out on a date, but his roommate assured Jeremy it was too creepy to ask out your student. A small roadblock. Fast forward a year, and our paths crossed again at a recruiting event. But yet again, I stonewalled Jeremy. But as the old saying goes, third time's a charm. During his summer sabbatical, Jeremy saw my name on the intern listing. Two years more confident, Jeremy told his then (other) roommate, "The hot girl from my class is interning… I'm going to go hit on her." In the awkward setting of forced networking, Jeremy marched right up to me and declared "I think you were in my class." I replied by holding up my cell phone saying, "Yeah, I think I still have your number" as Jeremy Hollerm flashed across the screen. Little did I know, one day I would take on that last name, with more proper spelling, that will be butchered and misspelled for the rest of my life. In December, 2015, we went to Hawaii for our “annual December vacation”. On the 2nd day of the vacation, we headed to Volcano National Park on the other side of the island. After we drove around the park for a little bit, we had settled on what would be our first hike. It was a scenic 4-mile hike around the rim of a caldera. Until we were about 75% of the way through the hike, we didn’t realize we had started at the wrong end. The hike got very steep, very fast. As we came upon a lookout point, Jeremy started feeling around in his backpack. It felt like it was 100 degrees, and I knew we were so close to the car. All I wanted was air conditioning. So naturally I told him to hurry up. As we came upon another lookout point, Jeremy suggested I take a picture. I quickly took the picture and was focusing back on getting to the air conditioning. When I turned around, Jeremy was on one knee digging through his backpack “looking for water.” My mind, still on the air conditioning, offered him the water in my hand. As the words left my mouth, he pulled out the ring box and I quickly realized what was happening! What is your favorite part about wedding planning so far? My favorite part of planning is the overall design. Coming up with the details of every aspect of the day and finally starting to see things come to fruition is so exciting. I can’t wait to see it all together! Apple Watch Yay or Nah?